George Robert Kennebeck was born in 1892, in Carroll, Iowa, where he graduated from high school in 1911. He received his doctor of dental surgery degree from the Dental College of the State University of Iowa five years later. On September 17, 1917, he was commissioned a first lieutenant in the Dental Corps of the Regular Army and assigned with the 88th Infantry Division of Camp Dodge, Iowa. In April 1918, General Kennebeck entered the Medical Department Officers' Training Camp at Camp Greenleaf, Georgia, and a month later was assigned to Camp Gordon, Georgia. Later that year he was assigned to the Office of the Surgeon General at Washington, D.C.
Illinois, and in 1924,vas reassigned to the Office of the Surgeon General. In September 1926, General Kennebeck entered the Army Dental School in Washington, where he was an honor graduate and medalist. In February 1927, he entered the Medical Field Service School at Carlisle Barracks from which he graduated with honors the following June. He then was assigned to Fort Hayes, Columbus, Ohio, and in 1929, was p1aced in charge of the Dental ROTC Unit, State University of Iowa. and retained that position after the establishment of U.S. Air Force headquarters in September1947, and the subsequent redesignation of the Office of the Air Surgeon to the Office of the Surgeon General, U.S. Air Force. He was named assistant for dental services in that office in January 1951. He became a patient at the hospital at Bolling Air Force Base, Washington, D.C., in June 1952. General Kennebeek was awarded the Legion of Merit in September 1946, for his "direction of the organization, growth and development of the Army Air Forces Dental Services program from February 1942 to May 1946. He was promoted to captain (permanent) Oct. 4, 1918; to major (permanent) Oct. 4, 1929; to lieutenant colonel (permanent) Oct. 4, 1937; to colonel (temporary) Feb. 1, 1942; to colonel (permanent) Oct. 4, 1943; to brigadier general (permanent) April 28, 1948; to major general (temporary) July 25, 1949. Buried in Arlington National Cemetery. On July 16, 2001. 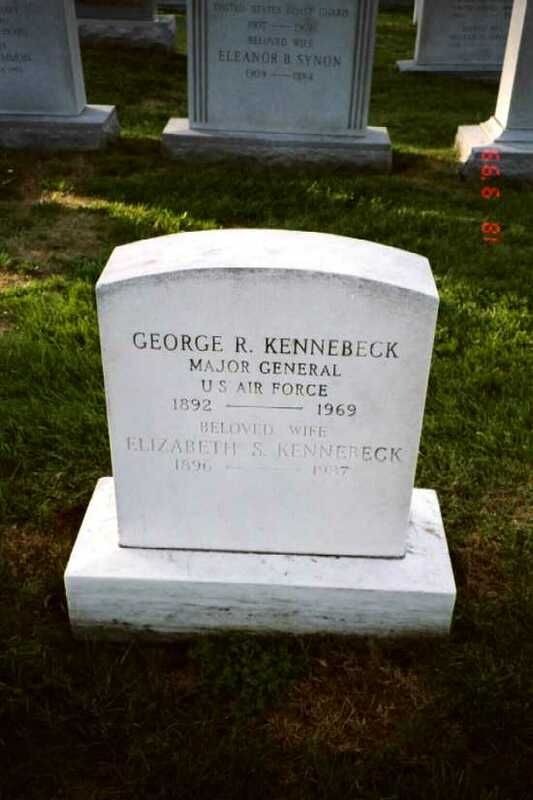 Beloved daughter of deceased parents, George R. Kennebeck, Sr., Major General, USAF (Ret.) 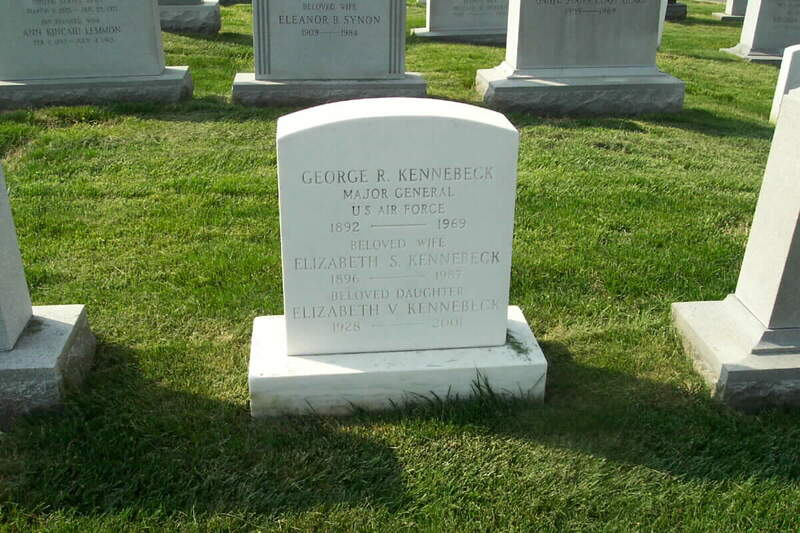 and Mrs. Elizabeth S. Kennebeck; loving sister of George R. Kennebeck, Jr., Colonel, USAF (Ret.). A graveside service and interment will be held on Tuesday, July 31, 1 p.m. in Arlington National Cemetery.